Assigning Salesforce campaigns to your tracking sources in CallTrackingMetrics allows you to link activities associated with a tracking source to a specific campaign in your Salesforce account. You will need to enable the Salesforce integration in your account before you can assign campaigns to your tracking sources. Use the left-hand navigation or scroll down to the Associate Campaigns section of the settings page. Click Associate Campaigns to automatically generate new campaigns in Salesforce based on the existing tracking sources in your account. 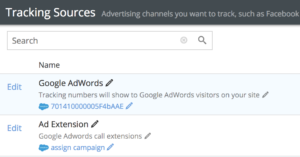 The new campaigns will have the prefix “CTM” followed by the tracking source name so that you can easily identify them. Each tracking source in your account that has not already been linked to a Salesforce campaign will have displayed below the source name and description. Click assign campaign and select the campaign you wish to link to from the drop-down that appears. Once a campaign has been assigned, the campaign ID will be displayed below the source name and description. Navigate to Numbers → Tracking Sources and locate the tracking source you wish to update. Click the pencil icon next to the campaign ID. In the pop-up window that appears, use the drop-down to select a different campaign. If you wish to remove the campaign from the tracking source, click the x in the drop-down menu.